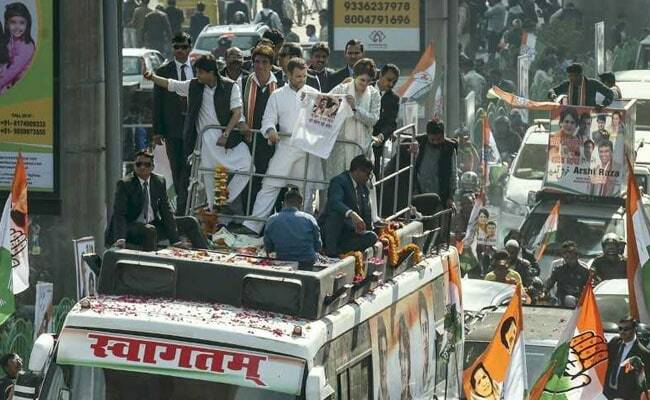 Hundreds of Congress workers ran alongside as Priyanka Gandhi Vadra, her brother and Congress president Rahul Gandhi, Jyotiraditya Scindia and several others stood on the roof of a modified truck weaving through the packed streets. Priyanka Gandhi Vadra waved, grinned, flashed a thumbs-up sign and pointed Hillary Clinton-style as she launched her charm offensive in Uttar Pradesh today with a roadshow through Lucknow, a longtime BJP stronghold. They tried to catch Priyanka's attention, some showering petals, others throwing garlands and even party t-shirts at her. She scooped them up and threw them back to the crowds. The truck inched its way through streets splashed with posters of Priyanka Gandhi and Rahul Gandhi. Many billboards starred Priyanka Gandhi and her grandmother Indira Gandhi, underscoring -- for those who may have missed it -- her striking resemblance to the former prime minister. "We see Indira Gandhi in her," said a poster on the 47-year-old mother of two. As the Gandhi siblings passed under a bridge, a motley group of supporters competed for their attention. One group was in neon lungis and painted chests; some workers were dressed in pink and called themselves "Priyanka Sena". Priyanka Gandhi and Rahul Gandhi looked up at the spectacle and waved at them all. "Today Congress has created an aandhi (storm)," a worker gushed. 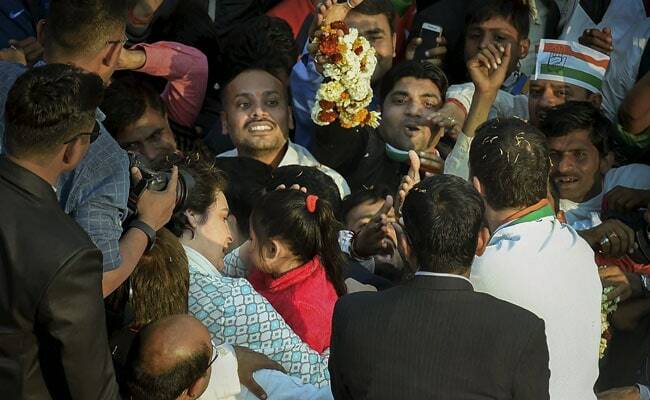 Midway through the mega roadshow in UP, Priyanka Gandhi was photographed playing with a child from the crowd. The Congress has pinned its hopes on Priyanka's much talked about mass connect and natural charisma to revive its lost base in Uttar Pradesh, a state that gave it many prime ministers but which turned away from the party over three decades ago, alongside the rise of regional powers like Samajwadi party and Bahujan Samaj Party and the surge of the BJP. For years, Priyanka shunned a bigger role outside the family strongholds of Amethi and Raebareli - the constituencies of her brother Rahul and mother Sonia Gandhi - limiting her campaign to a tiny part of India's most politically vital state with the most number of parliamentary seats. As the Congress announced her debut two weeks ago, sources said she had decided to take the plunge since her son Rehaan and daughter Miraya are now older. Critics, mainly the BJP, dismiss the younger Gandhi sibling as a seasonal campaigner whose ability to win votes for the party is largely untested.